Malia Sesilia Salt was born in Houma, Tongatapu, on 25 March 1936. Her parents Charles Joseph Salt and Popua Salt were gifted with five children: four girls and one boy. On the 14th of November 1958, Malia Sesilia Salt entered the novitiate at Heretaunga, Wellington, New Zealand and received the name Sr Malia ‘Akenete. On the 8th of December 1961 she made first profession as an SMSM. From 1964 to 1970 she was in Waltham, USA, where she studied. In 1967 she made her final profession in Waltham. 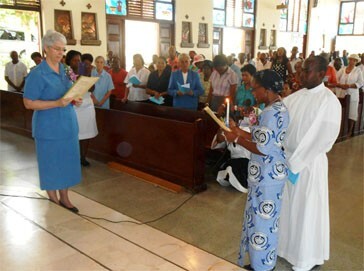 In 1971 she returned to Tonga and taught at St. Mary’s High School and ‘Ahopanilolo Technical School. In 1974 to 1984 she served as Regional Superior, the first Tongan to take up this service. In 1985 she taught at Chanel High School, Vava’u. From 1986 to 1989 she was missioned to New Zealand where she served the Tongan community within the Diocese of Auckland. 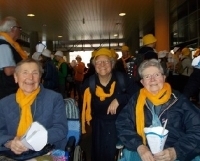 She returned to Tonga and for many years was a great supporter of the “Marriage Encounter” group. She believed that a good family life is the foundation for a good Christian family. From 1990 - 2008 she generously served as Secretary to three Bishops of Tonga: the late Bishop Patelisio Finau sm, Bishop Soane Lilo Foliaki sm and the present Bishop, Soane Patita Paini Mafi. She gave her all as a secretary. Sr Malia ‘Akenete was a loyal and loving SMSM for 48 years and after two years of battling with cancer she died in Ma’ufanga on 21 May 2009. 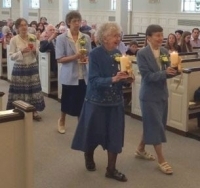 She witnessed to many people by her love of God and the way she lived as true follower of Jesus and his message. She was a person who was not afraid to speak her mind; she had a strong sense of justice and spoke the truth in love. Whatever she did she put her whole heart into it and gave her all. In her compassion, she reached out to the marginalised and the sick. 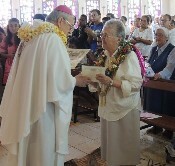 Because Sr Malia ‘Akenete had a great love of her Marist and Missionary vocation she repeatedly invited young women to join Religious Life and challenged those who hesitated. She was involved in this work until she got sick. 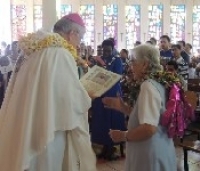 She played a big role in SMSM formation in Tonga. Many of us owe her a debt of gratitude. Sr Malia ‘Akenete had a great love of Mary. Like Mary, she was a faithful servant of the Lord and with her she would say: “I am the handmaid of the Lord, be it done to me according to your will”. Sr Malia ‘Akenete, we ask you to pray for us and for smsm vocations, something which was very dear to your heart. 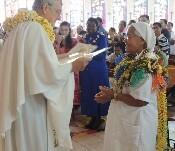 Thank you Sr Malia ‘Akenete for being a living witness to all of us in your Missionary, Marist and Religious vocation. By your prayer, keep me in the love of your Son until He comes”.